Dave here. Wow! 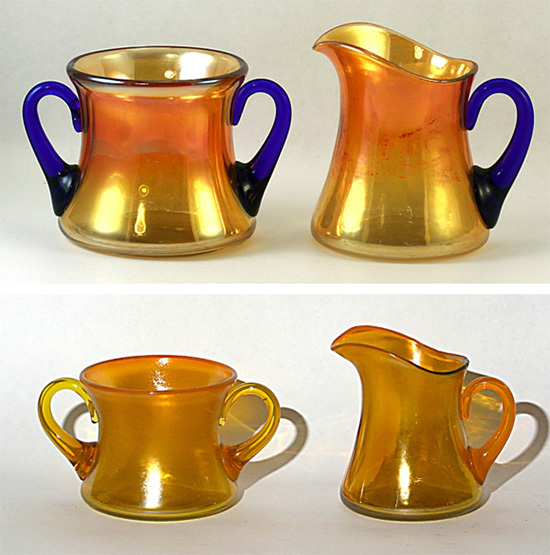 It seems like just yesterday that I started my discussion of creamer and sugar sets made by the stretch glass manufacturers. That’s right, it is Tuesday Stretch time and BugDoc Dave’s turn! I had illustrated the sets made by Imperial and Diamond glass a couple of weeks ago. 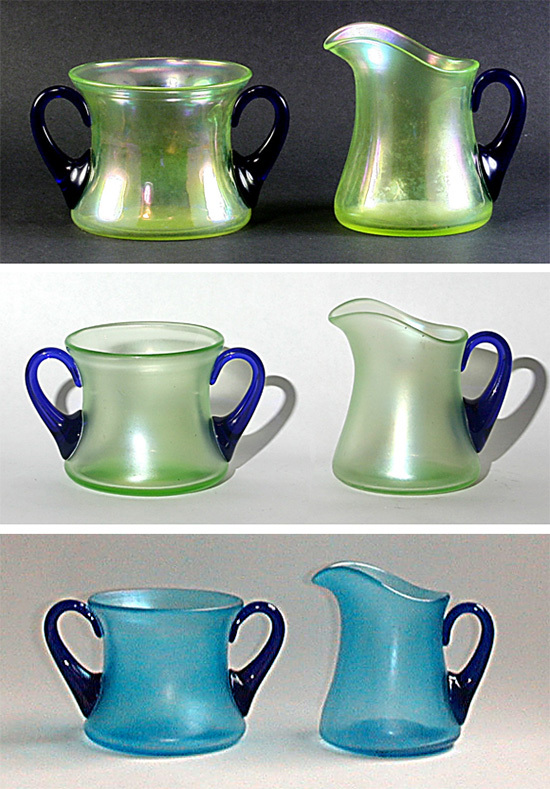 Today, I’ll cover the remaining companies that made creamer and sugar sets with a stretch finish – Northwood, Fenton and U.S. Glass. Northwood made only one set that is known. 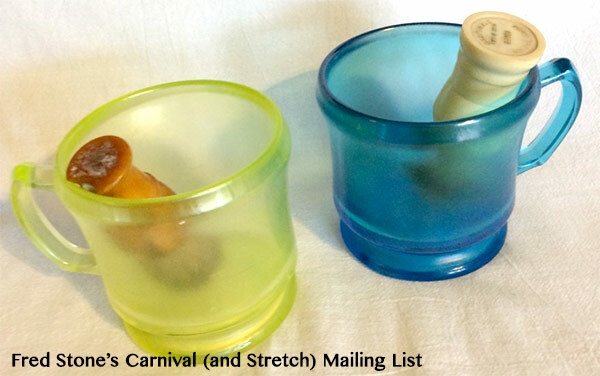 This is set is often called “Barbella” by carnival collectors and the name is also used by stretch glass collectors. This set is only known in Topaz (vaseline) and it has a rib-optic interior pattern. The two-handled sugars seem to come in two forms, lidded and not lidded. Most of us originally thought that the non-lidded sugars simply had lost the lid, but as you will be able to see from the image, the lidded sugar jars are slightly larger in diameter! The set is very similar in size and shape to the Northwood ‘Grape and Gothic Arches’ sets, except for the external designs found in the grape and arches sets which come in various carnival treatments. Actually, this suggests that the lidded jar was used for something other than sugar, possibly a marmalade or jelly jar?! Unfortunately, we don’t have any catalog pages illustrating this set, so we’ll probably never know the numbers/names or designations made by Northwood. In advertisements of the Grape and Gothic Arches sets, a complete “table set” consisted of a creamer, sugar, covered marmalade and covered butter. In any case a complete Barbella set is very difficult to accumulate and one has to complete with other collectors that desire creamer and sugar sets! 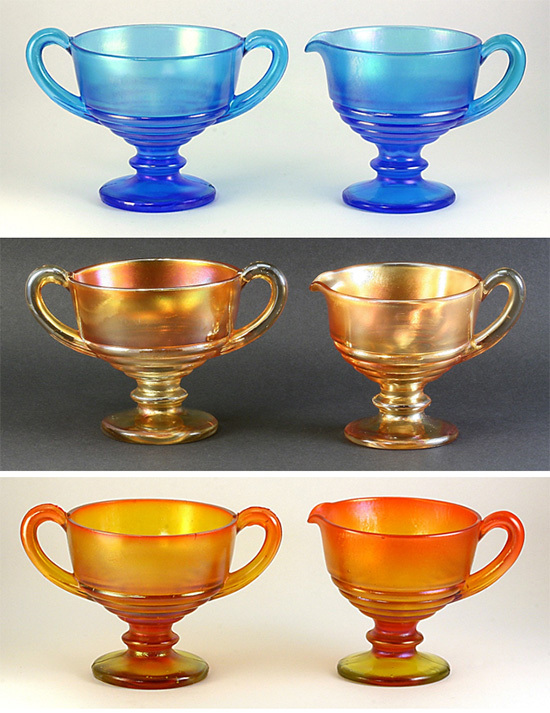 Fenton made the greatest array of creamer and sugar sets with four types known. Three are press-molded and one set is blown-molded. The blown molded set was designated as #2 by Fenton. This set is very delicate, and being blown-molded, the handles were applied. This set usually comes in Topaz, Florentine Green, Celeste Blue, Grecian Gold (marigold) and Persian Pearl, but Tangerine sets are known. Notice that the Tangerine set has Tangerine handles! A much less common set has a rib optic pattern and molded handles. This is usually found in Topaz or Celeste Blue. Unfortunately many of the sets have small chips around the top rims and finding a perfect set can be nearly impossible! Without a doubt, the #3 set is the most commonly found set. This one comes in most of the Fenton stretch colors, including Velva Rose. However, I don’t recall seeing a set in wisteria (purple). This set also has molded handles and a pedestal foot. 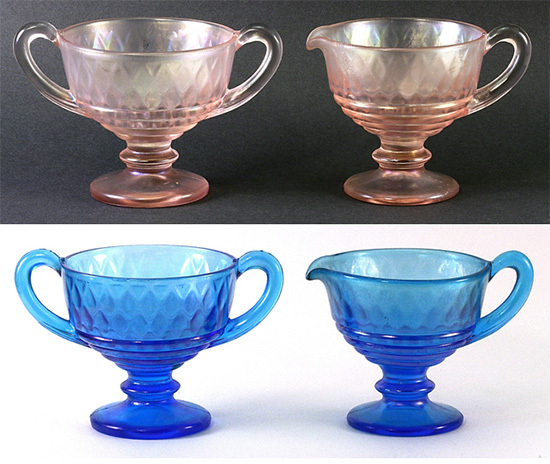 When a diamond optic plunger was used, this creamer and sugar set was designated #1502. These sets are not overly rare, but getting a set can be difficult and expensive because of the added design! Finally, we have one creamer and sugar set made by U.S. Glass. It appears that this set was made in their #310 line that has external paired rays which end in points at the top rim. However, if you look closely at this set, the paired rays are inside (optic)!! 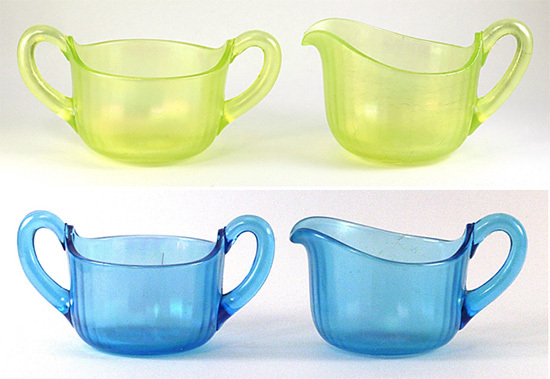 This creamer and sugar is known in pink and green, but not iridized. The only iridized ones were made in their opaque yellow color. While the handles may look like they are applied, they are molded. Happy hunting! !